STILLWATER — That one wasn’t pretty. The Oklahoma State baseball team fell to West Virginia 11-1 on Friday in Allie P. Reynolds Stadium. WVU starting pitcher Alek Manoah threw eight shutout innings, and the real competition of the game was between WVU’s runs and Manoah’s strikeouts. That game finished 11-1. So, Game 1 of the team’s three-game series goes to West Virginia with Game 2 starting at 2:05 p.m. Saturday. Here are five thoughts from Friday’s beatdown. Tyler Doanes started Friday’s game with a line drive to right field. 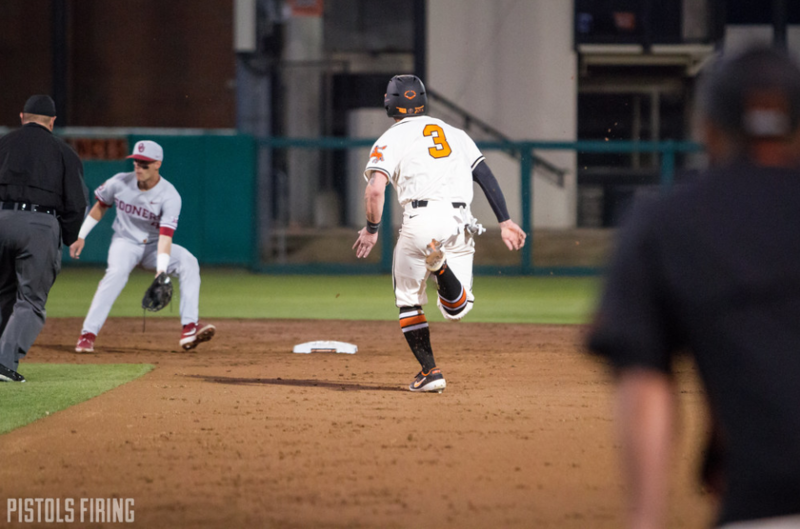 It seemed like a routine play for OSU right fielder Cade Cabbiness, but he ran in too far and the ball went over his outstretched glove. Doanes coasted into third, and Jensen Elliott’s tough outing started. The Mountaineers went on to score three runs in the inning. Elliott finished the first having thrown 41 pitches. Positively for Elliott, he was able to leave three Mountaineers stranded the end the frame. In total, WVU left 13 players on base Friday, so it could’ve been a lot worse. Elliott threw three innings Friday where he allowed seven hits and five runs. It’s never ideal when for a pitcher to give up early runs, but it’s especially troubling when it’s the first pitcher of a three-game series. In a standalone game, Elliott might have not been out there too long, but the Cowboys chose to not tax their bullpen too much with two more games to come this weekend. After Elliott’s three innings, C.J. Varela came on to throw three innings before Tanner Sparks, Nate Peterson and Noah Sifrit split the final three. OSU pitching coach Rob Walton saved his frequent bullpen pitchers, as it was only Sparks’ second appearance this season. Although Sifrit has played plenty in the field, it was only his third appearance on the mound this year. Speaking of Sifrit, he was the only OSU pitcher to not allow a hit Friday, and he had half of the Cowboys’ hits. Sifrit started the evening in left field. In the sixth inning, he singled to left field on his second at-bat of the game. Then in the top of the ninth, he got called upon to pitch. He got back-to-back outs to start the inning before walking WVU catcher Ivan Gonzalez, but he worked around that with a strike out to end the frame. He was the first batter up in the bottom of the inning. Sifrit tripled to left center and was brought in as the Cowboys only run after a Max Hewitt sacrifice fly. Through his first two pitching appearances this season, Sifrit had a 54 ERA, only having made it through a third of an inning. After Friday’s game, he said not expecting to pitch and playing most of the game in left field helped calm down any nerves he had on the mound. Alek Manoah threw eight innings for the Mountaineers and his fastballs were in the low 90s in all of them. He finished the game having allowed only three hits to go with his 11 strikeouts. He allowed no runs and perhaps most impressively didn’t walk a batter. He faced 26 batters, just two over the minimum 24 for eight innings of work. Manoah is also massive at 6-foot-6, 260 pounds, so if this whole baseball thing doesn’t work out for him, he can go play left tackle for Neal Brown. The Cowboys were without Bryce Carter, Carson McCusker and Dylan Gardner on Friday, and after the game, Holliday said it was because of injury. He didn’t dive into the specifics of McCusker or Gardner, but he said Carter got hit with a foul tip in the catcher’s mask last weekend. Those three account for 63 of OSU’s hits this season. McCusker leads OSU in hits (33), doubles (11) and triples (3).